Saturday, September 25th is National Museum Day. What is National Museum Day you ask? It’s an annual event hosted by Smithsonian Media in which participating museums across the country open their doors for FREE to anyone presenting a Museum Day Ticket. Sounds like a good idea to me! The great thing is there are over 15 museums participating in San Diego County! Everything from the Museum of Making Music in Carlsbad to the Reuben H. Fleet Science Center in Balboa Park are taking part. It’s a great opportunity to see a museum you have never been to. 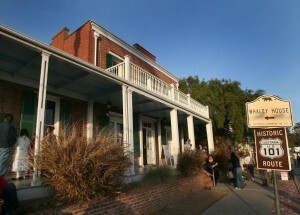 I have never been to The Whaley House Museum, so that is where I will be using my free pass. Where will you go? See the list below for participating museums. Be sure to bring your Museum Day Ticket with you for free admission. A favorite museum of ours is also the Reuben H. Fleet Science Center in Balboa Park. It really has something for everyone. Can’t make there on Saturday? No problem, comment on our blog below and two lucky winners will receive four complimentary passes to the Science Center! Comment by Monday, September 27th at 10:00 a.m. pst. This entry was posted in Arts & Culture, Attractions, Insider Tips and tagged art, balboa park, contest, family, free, fun, kids, museum, old town, san diego east county, san diego north county, things to do by Suzzanne. Bookmark the permalink. Congratulations to Mari and Caryn! You won four passes to the Science Center. Thank you everyone for posting. Keep checking back for more great promotions! I had my ticket for Saturday, but I was unable to make it due to a family emergency, but I would still love to attend. I love the Ruben H. Fleet Science Center! I have gone there since I was little. I would love to bring my little brother there! Can’t make it on the 25th, but will be hitting the museums on my next visit! I love Balboa and want to visit so many of the others! I grew up in san Diego county and miss it so much. It’s great to have free events with two kids! We’ll be heading down from Orange county so they can see the space center for the first time. My 3 kids love the museums!!! I’m so glad they have these free days every once in a while because they can get expensive, then I feel bad I can’t expose my kids to some culture because it’s starts to get too expensive with a big family! Who ever wins, have fun and take advantage of the free day!!!!!! The museums are fun! I need to take the kids there soon. Hi Rhys- Here is more info. on Ntl Museum Day. Your Ticket will be emailed to you after you submit your information. Please remember to print and bring your ticket to your selected participating museum. Complete rules are at the bottom of the link. Wonderful! Will spend Sat in Balboa Park, Museum Hopping! Time to break out the walking shoes and picnic basket again! Wow so many great museums in SD free! Great! Does this ticket only get you into 1 museum or as many as you want? I love the Ruben H. Fleet Science Center!!! Sounds like I’m going to fit a museum in on Saturday.